We had the chance to do a demo ride of the new for 2017 little roadster, so here is our first ride review of the G310R! Keep in mind this is not a thorough review, since the motorcycle was at my disposal for 45 minutes. 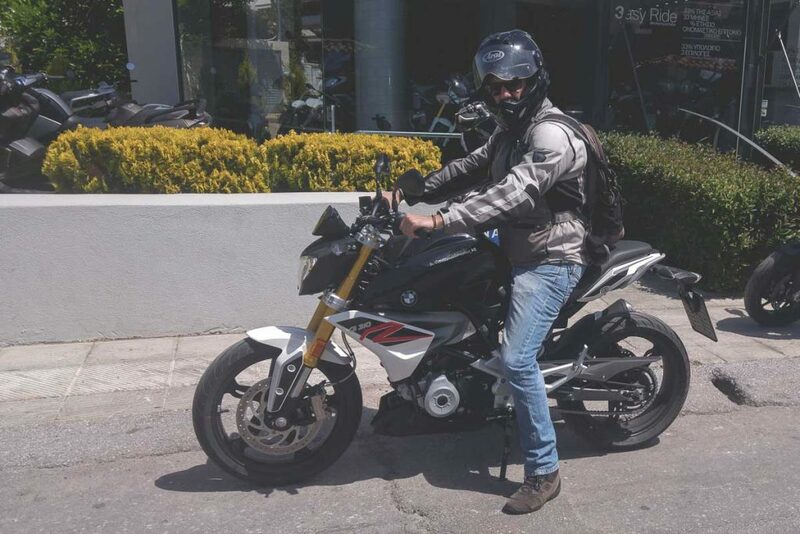 You will find all detailed information regarding the technical specifications of the bike on BMW’s official websites. There are some people that are concerned about the build quality of this bike. I can tell you this: I found nothing on the bike that gave me a bad impression. I’ve seen motorcycles from other manufacturers, within similar price range, looking less convincing about their quality. The little Beemer appears better than most other little thumpers that cost aprox. 5k. The bike fitted me almost fine, if not a little on the cramped side regarding my legs. I’m 175 cm (5 feet 9), so I believe a shorter rider will feel very comfortable with leg positioning and the angle of the knees. Taller riders will find their knees bending maybe more than what they would like. Seat is comfy! Regarding its height, you can see the image below with me sitting on the bike. Both legs firmly on the ground. Beginners and most short riders will be ok with this seat height. But even a too short rider should not find it difficult to put one foot on the ground and balance the motorcycle with some confidence, because the bike is light and narrow between the legs. It certainly feels lighter than the specified weight of 158 Kgs would suggest. To give you a comparison reference, my daily commute is a Honda XR250 Motard version. 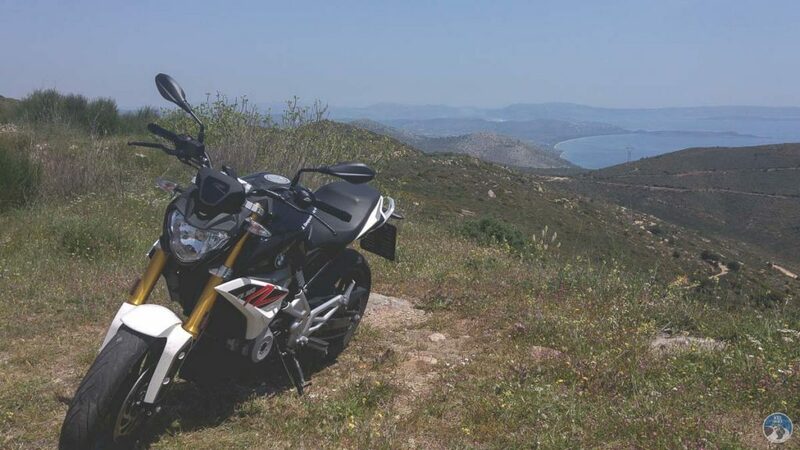 The G310R felt as light as the little XR, despite being 30 kilograms heavier on paper. While idling, the vibrations of the single cylinder are there. Definitely there. It’s a sweet little thumper. At low rpm the vibrations are noticeable. As you rev up, they become less and less, to the point I can say this is a very smooth single cylinder engine, especially between 4000 and 6000 rpm, which is a range of revs that it seems to perform the best. At higher revs there is some high pitch vibration, but to be honest, this is not a way to ride a thumper, keeping the engine revving high. What impressed me is the torque starting from aprox 3000 rpm and the way it pulls strong even at the high – usually not welcoming for a singe cylinder- high revs. When I say “pulls strong”, this is always in the context of a small egnine. 1st and 2nd gear ratios seemed a little short to me. The rest are nicely spaced between them and really add to the way the whole power plant delivers. Shifting was very clanky and noisy between the first 3 gears, and finding neutral was difficult. Those 2 are my only real negative remarks for this motorcycle. But it had only 340 kilometers in total on the odometer, so this should probably improve and the shifting should smoothen as the engine breaks-in. I also noticed a couple of times that the gear indicator on the dashboard showed some very noticeable lag, i.e. downshifting from 3rd to 2nd the indicator would keep showing 3rd gear on for a couple of seconds. The bike feels light, it is nimble. Commuting should be a piece of cake. It was for me, for the few 5-6 minutes that I had to negotiate some heavy traffic until I escaped the city blocks. 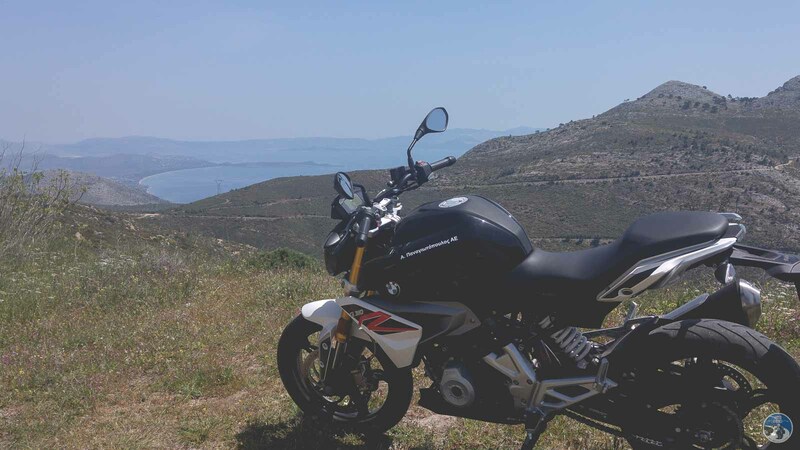 Then, on the winding mountain route of Penteli, it was a pleasure to ride. Suspension felt good, spring rates and preload were probably appropriate to my weight (75 kilograms), perhaps the rear was a little on the soft side. But don’t ask me about sag, I never checked. Rebound and compression were good both front and rear. The bike has a nice fast turn-in (no, not a racer like turn-in, come on) but without compromising any stability during the process which is important for beginners. The fact that it didn’t cause me trouble, even as I charged some corners rather aggressively, and that it didn’t gave me 2nd thoughts about the lines that I picked, speaks about how nicely balanced and put together it is. It let me focus on the road ahead and never distracted my attention, never felt unsettling. Nothing special to mention here. They are up to the job, they had a good feeling/feedback on the lever and the pedal. I did not had the chance to test the effectiveness of the ABS. A great proposal for beginners, but also for experienced riders who look for a small capacity motorcycle to commute (but don’t want the design of a scooter), or a small motorcycle that can offer loads of fun on the low side of the budget. Should this bike prove to be reliable on the long run, it is a winner! Now let’s wait for the GS version of it to come, while we go back in the office to assess if this should be added to our rentals fleet ! I recon with a few well designed (in terms of practicality) accessories it would make a nice little option for short road trips!